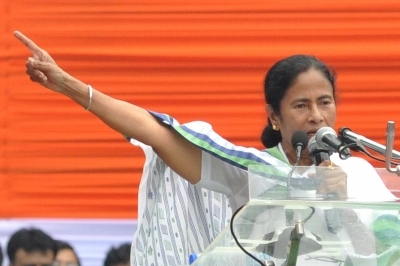 Kolkata, July 21 (IANS) In a blistering attack on the BJP, West Bengal Chief Minister Mamata Banerjee on Friday accused it of indulging in massive corruption in many states, and claimed the central agencies were completely silent on the saffron party’s scams. She also threatened to slap defamation cases worth thousands of crores if the probe into the Saradha and Narada cases by the CBI and other central agencies did not proceed in a genuine way. “In Madhya Pradesh, there is the Vyapam scam, in which several people have already been killed. Where is the CBI? The Gujarat Petroleum scam runs into Rs 20,000 crore. Where are the government agencies, like CBI, Enforcement Directorate or the Income Tax authorities?” Banerjee said at a massive public rally organised by the Trinamool Congress in the heart of the city. The Trinamool chief said the ruling BJP at the Centre was trying to silence her party as “it was the most vocal in its protests”. “Do we have to take character certificate from you on whether we are good, or not? We despise your character certificate. We only accept people’s character certificates,” she said. Banerjee said across the country, the CBI is being “let loose” against anybody talking about the ills of demonetisation or GST. The Trinamool chief alleged that the BJP was threatening to use the CBI and frame people in the Saradha ponzi scam and Narada sting footage cases if they did not join its fold. Without naming Prime Minister Narendra Modi, she said that “Barda” (elder brother) will have to bow out of office after the 2019 parliamentary polls. At the same time, she speculated that the parliamentary polls could be pre-poned to next year. “They could go for parliamentary polls next year. I don’t know. I was hearing something like it,” she said. “We say, go ahead with Saradha and Narada, in 2019 Barda will have to go. The bardas will have to bow out from power in the country. It’s a challenge. Challenge on Martyr’s’ Day,” she said. Banerjee also questioned why the Saradha probe was proceeding so slowly for the past four-five years. She said with regard to the Narada probe the central agencies were announcing they would call all top Trinamool leaders one by one. “They think if they summon them, they will be disgraced. If the case does not progress in a genuine way, we will slap defamation cases worth thousands of crore rupees against CBI and those behind Narada. We will fight it out. Because we firmly believe that none in our party is guilty,” she added. Banerjee also lashed out against cow vigilantes, saying in the name of cow protection they were burning killing and torturing people. “They are pronouncing their diktat on what somebody should wear. Some people are told they can’t have meat. Pregnant women are being told they can’t have eggs. What will people eat then?” she asked. Banerjee alleged that a “more than Emergency” situation prevailed in the country, with citizens not sure about protection of their rights. “Common people do not know whether their rights are protected. Dalits and minorities don’t know whether they can live with dignity. Even Hindus don’t know whether they they can survive with dignity because of some fake Hindus,” she said. Banerjee said except in Bengal, nobody was safe even in Delhi. Naming Nobel laureate Amartya Sen, who has faced constant criticism from a section of BJP leaders, she said: “Even Amartya Sen is not safe”.